Hardcover, 8 x 10 in. / 112 pgs / 100 color. 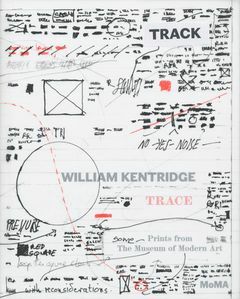 Text by Judith B. Hecker, William Kentridge. 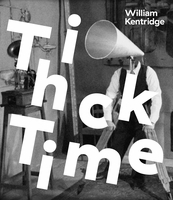 William Kentridge's art brings together drawing, film animation, sculpture and performance. He also applies his astonishing draftsmanship to the techniques of printmaking, including etching, screenprinting, lithography and linoleum cut. In fact printmaking has always been essential to his work, from his earliest forays into artmaking in the 1970s to his recent operas. “Printmaking has been not just an edge to or a side journey from the work that I've been making over the last 30 years or so,” the artist has said, “but is very much a key to it.” Kentridge's love of the printed image extends to books, and he often draws and prints on unbound pages from encyclopedias, ledgers and the like. In Trace, both a catalogue of prints from the Museum's collection and an artist's book, Kentridge uses translucent pages interspersed throughout the book to respond to his prints reproduced beneath them, in a dialogue between past and present. The book also includes a lecture by Kentridge on printmaking, illuminating its relevance to his broader practice. FORMAT: Hbk, 8 x 10 in. / 112 pgs / 100 color.